I got him as a healthy little 8-week-old puppy with his brother and their first vaccination and deworming up to date. I took them for their second vaccination at the age of 10 weeks, and about a week after that I took them for their very first grooming at the groomer. They looked super-adorable with their cowboy cuts. About a week and a half after that I noticed both my puppies looked very ill so I rushed them to the vet and my worst nightmare was confirmed, they both had Parvo. They were admitted. Morgan, my little hero, was the biggest of the 2 pups but yet he had the Parvo the worst. He was just laying there. His brother, on the other hand, recovered within 3 days and he was home. Morgan stayed there and my heart was shattered when the vet told me I should probably say my goodbyes as he doubts that he is going to make it. We were on day 6 and they were doing everything they could but he was just not showing any improvement. I held his little almost lifeless body in my arms, sobbing, looking into his milky eyes, begging him to get better and come home to us. We already loved him so dearly although he was only in our lives for a couple of weeks. I also prayed to God – I doubt that I have ever prayed so hard for something. So I said my goodbyes and thought this is it, this was the last time that I will ever see my little boy again. I couldn’t sleep that night. I was waiting for the call from the vet, that terrible, terrible call, but that night passed with no call. Early the next morning my phone rang and I felt like crying. I answered expecting the worst. But on the other side of the phone I heard a very happy vet, in tears, telling me he can’t believe what he just witnessed but Morgan is sitting up, he is eating and drinking without vomiting. They did tests and he is cured and I can come fetch my baby. Tears of joy streamed down my face and I really didn’t know how to thank God for this miracle. It was a tough 7 days, not just for Morgan, but for me as well. I walked to the vet to see him every single day which is easily 7 kms away from home so my daily walk was 17 kms as we only have 1 car and hubby used it to get to work and back. But Morgan’s story doesn’t end here. His brother got sick again where he got a prolapse and the vets tried everything to save him but in the end we had to let him go on their 5 month birthday as his little body just couldn’t carry on anymore, and Morgan and Logan were very very fond of each other. Morgan missed his brother so much that he got sick all over again. He wouldn’t eat, he wouldn’t drink, he wouldn’t play, he would just lie there. So off I went again to the vet and he told me all that will make it better is a friend but he will give him medicine to give him an appetite. So each and every day I would walk with Morgan in my arms to my parent’s house, about 5 kms away, because there’s doggy friends there that he can play with and oh was he happy. We got him a friend the end of that month and today they are the world’s best friends. We spent thousands and thousands of rands on Morgan but every single cent was worth it as he is the light of our lives and we love him to bits. I know to most Morgan is just a dog but to me he is my little boy, my whole heart. 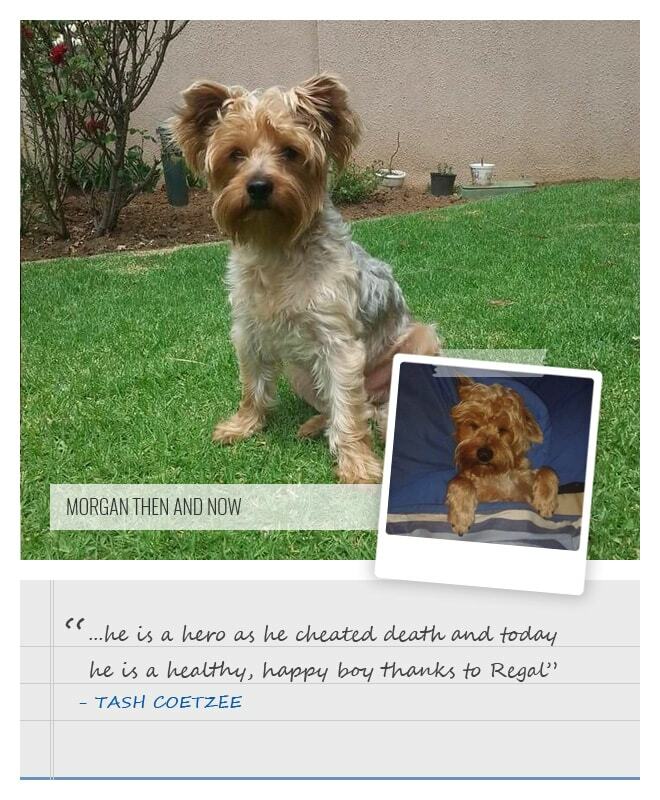 So this is my Morgan’s story and why he is a hero as he cheated death and today he is a healthy, happy boy thanks to Regal. 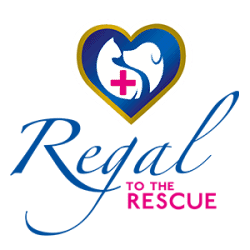 He loves his Regal Stress and Anxiety Remedy, Everyday Vitality Tablets and Skin Care Biscuits. He also loves bathing with the Tick and Flea Shampoo. The reason for the Skin Care Biscuits: Every time he came back from the grooming parlour he seemed to itch quite a lot. So I tried the Skin Care Range and that helped an awful lot as he doesn’t itch all that much anymore after his groomings. Also, during winter, I think his skin gets dry and then he also itches and the Skin Care Range also helps with that problem. Tick and Flea Shampoo: I don’t like dipping him so much because it’s actually poison that they get dipped in. So I tried the shampoo and it works wonders. I wet him, rub the shampoo in, and leave the shampoo on for a few minutes and rinse off. I couldn’t believe how wonderful this shampoo works and it also smells great. As for the Stress and Anxiety Remedy, I decided to try it on him because he is very nervous since he got out from the vet. After his Parvo he was a nervous wreck. He used to hide from anyone he did not know, was very shy, and he was very very scared of everything and everyone except me and my husband. He started using this and on his second bottle I started seeing a difference. He wasn’t so scared anymore and today anyone can come up to him and pet him without him running away and trying to hide like he used to. He is more playful and loves going for rides with us whereas he never liked it because I think he thought we were going to drop him off at the vet again.